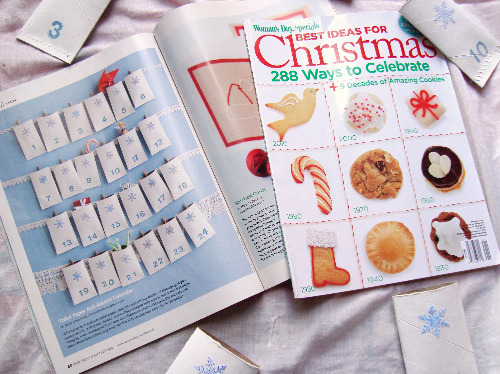 Woman's Day Magazine contacted me over the summer about contributing my 2009 count down calendar to a special holiday issue. Exciting stuff! They were absolutely wonderful to work with in every way. I've been scanning the supermarket magazine racks for the last couple of weeks to no avail, but then a huge box arrived on my doorstep last Friday. It contained everything I had sent down to NYC for the photo shoot, including two copies of the freshly printed magazine. Whooot! 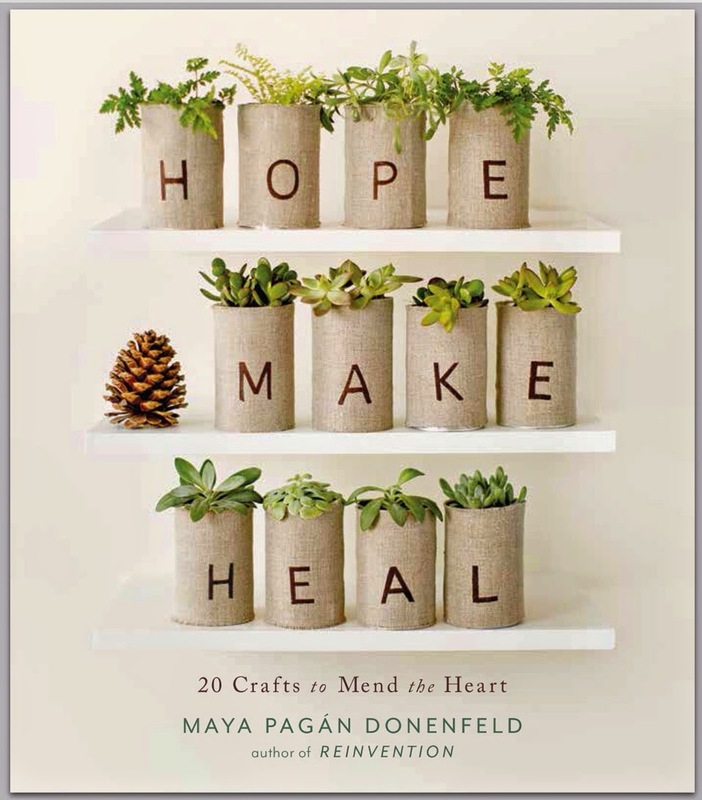 It's filled with great ideas for winter crafting, so keep your eyes peeled in the check out line. 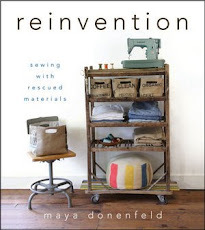 There are some other familiar, crafty bloggers I spied within the pages, and it feels great to be a in such nice company. Most of all, I'm happy to have my advent calendar back in time for this year's count down. I'm planning on making a new design, of course. That's become my tradition, but I figure it will be nice to have one set for each child. So, now you have a head's up good and early this year: start saving your toilet paper rolls again! If you'd like to make the one right here, follow this link for the instructions. Funny that they were shipped to NYC. For the Witchcraft book I had to ship homemade snowglobes to NYC too. Guess that's the place for crafts! As of today I am saving my toilet paper rolls for our upcoming advent. awesomeness! congratulations and thanks for sharing your project ideas! Hope you're having a great week! That is fabulous..you are the cleverest thing! Congratulations and what a gorgeous project! My Bug always collects the "skittles" (one of our first projects) from the toilet rolls so I thin we aldready have at least twenty-five ready and waiting. Wow! Congratulations! That's so fantastic. 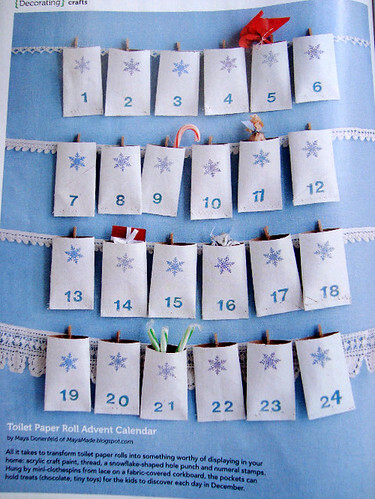 It looks great and is a really wonderful idea for an advent calendar - maybe I'll have to start saving toilet rolls! With four girls in our house, we will have enough toilet paper rolls in no time! Congratulations- very cool idea. And how nice that you were chosen. I will definitely be doing this. Hi! I really like it and I would like to read the instructions but the link seems to be broken... Is it my browser or may be something went wrong when linking it? Thank you so much for sharing this wonderful and beautiful idea! congratulations! i think my kids will be really excited when we do this and have hidden miniature surprises in its tiny box! oh my goodness i am so excited for you and can't wait to get the mag! many many congratulations...your idea is not only clever but very original too! Congratulations Maya! Miss you guys...at least I can keep up via the blog. How exciting, Maya! Congratulations on your much deserved success! Congrats on your newest feature! Wow, love this - and congratulations! Congratulations on the major magazine feature. And I think I need to start working on this bugger right now. I remember that from last year and thought it was so excellent. Hoo boy! I did a double take and a HALF when I spied those tp rolls in the first shot, then had to read on, just to confirm. How flippin' brilliant! Now THIS I can do. Hopefully three times, for my three littles. Congratulations! You so deserve the recognition! I'll have to keep my eye out for that magazine and pick one up... it looks great and I'm a sucker for Christmas crafts! Congrats! That's so awesome, I'm looking forward to seeing it in the magazine.